Both of these items are monumental for Franconia Conference. Therefore, delegate discernment around them began this past week at two Assembly Scattered meetings. These meetings are an opportunity for delegates to gather together and discuss the agenda items and ask questions of conference leadership. 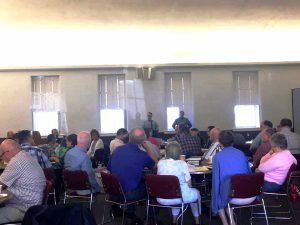 The scattered meetings began last week, one being held on October 5 at Franconia Mennonite Church and a second on October 10 at Swamp Mennonite Church with combined participation of around 100 delegates. Two more scattered meetings are scheduled for this coming week: October 16 at Nueva Vida Norristown New Life and October 17 via video conference. Currently, 61% of Franconia Conference delegates have either attended or are registered to attend an assembly scattered meeting. These scattered meetings provide vital discernment time as together, delegates work to confer around whether or not to admit four new congregations as members and whether or not to continue to envision a single united conference with Eastern District. The hope is that by the end of Assembly 2017, Franconia Conference will know if they have 4 new member churches and whether or not they will be working to implement a team to envision a united conference with Eastern District (EDC), so that in November of 2019 they will be able to vote on whether or not to merge with EDC. Since 2011, Eastern District and Franconia Conferences have been working together more formally with their leadership, meeting on a regular basis and sharing in joint assemblies each fall. Congregations in close proximity have also worked at building relationships. At the 2016 Conference Assembly, both conferences agreed to implement an Exploring Reconciliation Reference Team (read more about that here) to see if Reconciliation was possible between the two Conferences. That team not only believes reconciliation is possible, but also believes there is a possibility for merger as laid out in their final report which can be viewed here: edc-fmc.org/exploring-reconciliation-report. However, there is still work to be done before merger can be considered. This year at Assembly, delegates will discern if they believe God is calling them to that work. As the Conference continues to work to equip leaders to empower others to embrace God’s mission, there is much prayer and discernment to be done. To learn more about the four new churches, check out the Congregational Profiles on the Franconia Business Tab at: edc-fmc.org/assembly/.